Kathleen Sebelius, secretary of the U.S. Department of Health and Human Services, testifies about the troubled rollout of HealthCare.gov Wednesday. The problems with the insurance-shopping website include outages, slow page loads and the inability of users to complete coverage applications. Some insurance providers say they have been receiving inaccurate application information from the website. The problems appear related to a number of factors, but HHS officials have talked little about the specific technology problems. A basic question: What is HealthCare.gov? HealthCare.gov is a key piece of the Affordable Care Act, the law often called Obamacare, passed by Congress in 2010. The website is one way for uninsured U.S. residents to shop for new health insurance plans, although people can also apply through the mail, on the phone and at some in-person locations. Sixteen states and the District of Columbia are running their own health insurance marketplace websites, while 34 states, including Texas, Florida, Pennsylvania and New Jersey, opted to be part of the HealthCare.gov marketplace. One of the goals of the Affordable Care Act was to open up pooled insurance markets where people without insurance could shop for inexpensive insurance plans. The law prohibits participating insurance companies from rejecting applicants because of pre-existing conditions, and it bans lifetime limits on insurance benefits. HHS officials say they have committed US$630 million to the website. Many of the fixes happening now will be including in the money paid to contractors to build the site, HHS Secretary Kathleen Sebelius said in a Senate hearing Wednesday. HealthCare.gov is made up of two main components, the data hub and the marketplace, or exchange. The hub, which experienced problems in the first couple of days after launch but has been generally stable since then, helps verify applicants' eligibility for insurance coverage and for subsidies. The hub provides a connection to federal data sources needed to verify consumer application information for income, citizenship and immigration status, among other things. It does not store any information, and is not a database. The marketplace, or exchange, is the part of the website where users can apply for insurance coverage and compare plans available. Many of the site's continued problems appear to be related to the marketplace. The specific technology problems remain a mystery, with HHS officials speaking in general terms during briefings and congressional testimony. One of the main problems appears to be software and database integration issues. Still, there are some other problems we can piece together, based on press briefings from Centers for Medicare and Medicaid Services (CMS) and congressional testimony from contractors, Sebelius and CMS Administrator Marilyn Tavenner. Problem No. 1: No contractor overseeing the entire site. No contractor was responsible for the entire site functioning properly, until CMS hired systems integrator QSSI for that role in mid-October. CMS had taken on the role of site functionality before launch, representatives of contractors QSSI and CGI Federal told lawmakers at an Oct. 24 hearing. Problem No. 2: Last-month changes. Executives with QSSI and CGI Federal, one of the primary contractors on the project, told lawmakers that CMS officials may have added to problems when they abandoned some site functionality within two weeks of launch. The agency made a decision to require website users to register before browsing for insurance plans because of concerns that the unregistered browsing functionality would not be ready by Oct. 1, according to the contractors and HHS officials. That decision likely led to the site's registration system getting slammed by users in the first days after launch, the contractors said. Problem No. 3: Inadequate testing. In addition, QSSI and CGI Federal have said the site wasn't adequately tested before launch. The HealthCare.gov team spent about two weeks testing the site, when CGI "would have liked to have months" to test how the multiple pieces of the project worked together, said Cheryl Campbell, a senior vice president for the company. Republican critics of the Affordable Care Act have raised repeated questions about the security of the site. CMS officials did not run an end-to-end security test on the site before it launched, although they tested individual components. Representative Mike Rogers, a Michigan Republican, has questioned whether CMS is adequately testing new code as contractors continually make fixes through this month. Sebelius and Tavenner have defended the website's security, saying that contractor Mitre has continually tested the site for security holes. The website complies with Federal Information Security Management Act [FISMA] and U.S. National Institute of Standards and Technology [NIST] security standards, and the site is using many of the same security practices as those used on Medicare.gov, they said. Still, there was one report this month of the website sharing a user's insurance application information with a second user. HHS officials said they fixed the code after finding out about the problem. So far, that appears to be the only security-related problem reported, but critics continue to raise concerns about the security of data at the website. CMS has not released the number of people whose applications for insurance coverage have been successfully processed. CMS officials say they will release the first set of numbers next week. 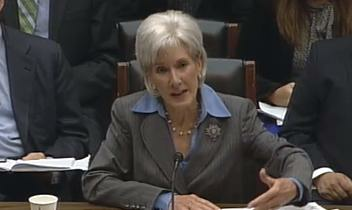 Officials are still trying to get accurate totals, Sebelius said this week. As of Oct. 25, about 700,000 U.S. residents have completed applications for health insurance, CMS officials said, but many of those applications still need to be processed. About half of those applications have come through HealthCare.gov, and about half through the state-run insurance exchanges. In the first month of HealthCare.gov, about 13 million people visited the website, Tavenner said this week. CMS has predicted sign-ups in the first weeks of a six-month enrollment period would be slow, based on early enrollment numbers when Massachusetts roll out a similar insurance program in 2006. There's some evidence that the number early enrollments have been extremely slow. During a Senate hearing this week, Senator Lisa Murkowski, an Alaska Republican, said only three people in her state had managed to sign up for new coverage through HealthCare.gov as of Oct. 29. In addition, Representative Darrell Issa, a California Republican and chairman of the U.S. House of Representatives Oversight and Government Reform Committee, released meeting notes from the HealthCare.gov team saying just six people were able to enroll on Oct. 1 and 248 had enrolled in the website's first two days.